If you don’t have a double boiler, you can put water in a saucepan and a metal bowl on top. Just be careful when you’re stirring the chocolate so you don’t burn yourself. When the chocolate is melted, immediately empty out the water and pour the chocolate in the saucepan. Add the condensed milk and other ingredients, stirring until combined. As soon as everything is combined, pour the chocolate into the baking pan lined with parchment paper. 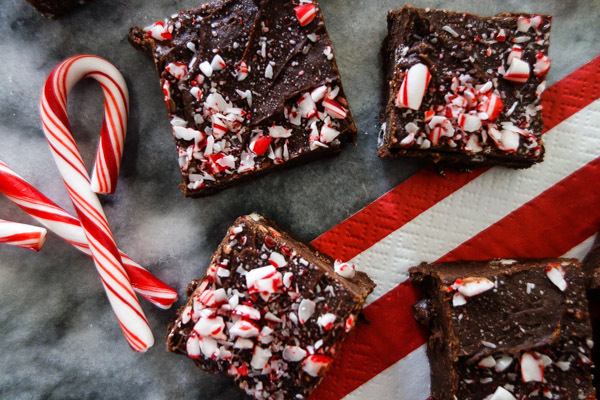 Crush the candy canes with a rolling pin (don’t crush your finger) and then sprinkle them on top of the fudge. Let the fudge cool for a 1-2 hours or until it is firm. Then, you get to cut it into pieces. There’s no science to the size of the piece, just use a really long and sharp knife. Adapted from Eagle Brand fudge recipe. Using a double boiler, melt chocolate, stirring frequently. When chocolate is melted, empty out water and pour chocolate in saucepan. Stir in condensed milk, salt, cinnamon, and sugar. Line a 9×13 pan with parchment paper. Spread chocolate evenly in pan. Using a rolling pin, crush candy canes. Spread crushed candy canes over chocolate. Chill in refrigerator for 1-2 hours or until firm. Remove from pan and cut evenly into squares.